A new study shows that stormwater runoff from urban roadways is so poisonous to coho salmon that it can kill adult fish in as little as 2½ hours. A new study shows that stormwater runoff from urban roadways is so toxic to coho salmon that it can kill adult fish in as little as 2½ hours. But the research by Seattle scientists also points to a relatively easy fix: Filtration through a simple, soil-based system. “It’s basically … letting the Earth do what it does so well, what it has done for eons: cleaning things up,” said Julann Spromberg, a toxicologist for the National Oceanic and Atmospheric Administration and co-author of the report published Thursday in the Journal of Applied Ecology. Scientists have long suspected that the mixture of oil, heavy metals and grime that washes off highways and roads can be poisonous to coho, but the study is the first to prove it. The research got its start more than a decade ago, when habitat-restoration projects began coaxing a trickle of coho back to several urban streams in the Puget Sound area. But many of those fish died before they could spawn. And the deaths seemed to coincide with rainstorms that sent runoff surging through drainage pipes and into the waterways. In some place, like Longfellow Creek in West Seattle’s Delridge area, up to 90 percent of females were killed. “It was apparent that something coming out of those pipes was causing it,” Spromberg said. She and her colleagues tried to reproduce the effect in the lab. But the artificial mixture of oil and other chemicals they concocted had no effect on the fish. So their next step was to try the real thing: Actual runoff, collected at NOAA’s Northwest Fisheries Science Center from a downspout that drains a Highway 520 onramp near Montlake. “When we brought out the real urban runoff: Bang! They were down, they were sick, they were dead,” said co-author Jenifer McIntyre, a researcher at Washington State University’s Puyallup Research and Extension Center. In experiments at the Suquamish tribal hatchery near Poulsbo, every coho exposed to the runoff died — some within a few hours, all within a day. Before death, the fish became lethargic, rolled around and swam to the surface as if gulping for air, McIntrye said. The fact that actual runoff proved fatal while the scientists’ concoction did not underscores an unsolved mystery about which chemical or combination of chemicals are so toxic to the fish. It could be any number of compounds that weren’t part of the artificial brew, including byproducts of oil and gasoline combustion, chemicals released by tires or tiny particles from brake linings, Spromberg said. But whatever the chemical culprit, the scientists found it could be removed by passing the runoff through 55-gallon drums packed with layers of gravel, soil and compost. None of the fish exposed to the filtered stormwater died or fell ill.
“It was remarkable,” McIntyre said. The finding is a strong endorsement of rain gardens, grassy swales and other “green” alternatives to traditional drains and pipes designed to collect stormwater. The idea is instead to let the runoff percolate through the ground, as it did before so much of the area was paved and developed. State regulations strongly encourage developments to use such approaches, according to the Washington Department of Ecology. A project called 12,000 Rain Gardens in Puget Sound is also promoting their use. “We should be seeing more and more of these systems in the future,” McIntyre said. 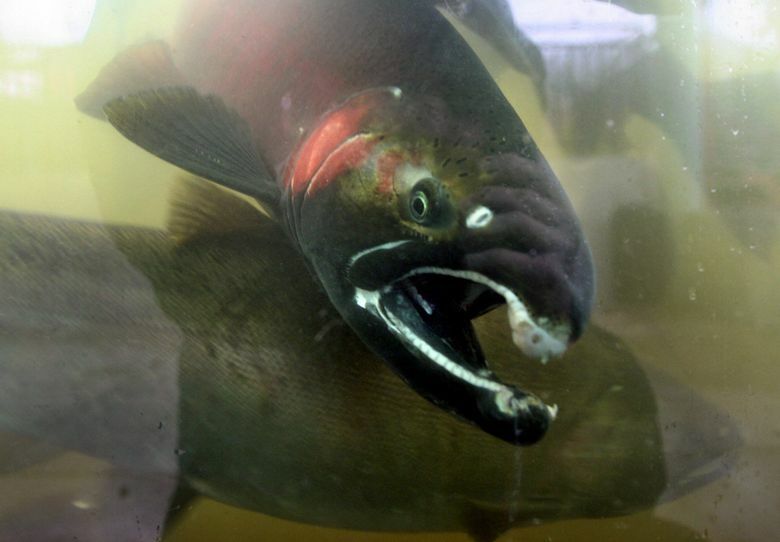 Coho, which were once abundant throughout the Northwest, may be particularly vulnerable to toxic runoff because they spawn in the fall, prompted by seasonal rains. Habitat destruction, fishing and other factors almost certainly contributed to the species’ precipitous decline, Spromberg said. Chum salmon, whose habitat and spawning seasons overlap those of coho in many places, don’t appear to be as affected by runoff — something the scientists plan to investigate this fall. Perhaps the major limitation of the study is the small sample size. Only 60 coho were used in the experiments, 20 in each of two experimental and one control groups. The scientists were lucky to get that many, thanks to the cooperation of the Suquamish Tribe, McIntryre said. Also, the urban runoff collected near Montlake was undiluted in the experiments and represents about the worst possible case: runoff from a busy highway in a big city, a DOE official who was not involved in the study pointed out. “It’s great that the treatment gets rid of toxicity from this nasty stuff,” Karen Dinicola of DOE’s stormwater program wrote in an email. But it’s particularly challenging to retrofit urban-collection systems with greener alternatives, she said. But the results of the research could help guide future development in rural watersheds where coho runs remain, the researchers said. And it can also be used to help inform urban-restoration projects as well, so fish aren’t lured back to appealing habitats, only to be clobbered by toxic runoff. The researchers are preparing for their next round of studies, which will include tests to zero in on what is actually killing the coho. The rain that soaked the region Wednesday also filled their runoff-collection barrels, Spromberg said.